In sharp contrast, participants met exclusively Palestinian and Israeli organizations that promote a one-sided Palestinian narrative of the conflict. These NGOs include those that promote BDS, lawfare, antisemitism, and even some that have links to the Palestinian Front for the Liberation of Palestine (PFLP) terrorist organization. Throughout the trip, delegates tweeted using the hashtag #JusticeDelegation, exposing their own biased itinerary. The Palestinian NGO Addameer is a leader of campaigns in support of Palestinians prisoners convicted of security offenses, referring to them as “political prisoners” and altogether omitting the context of violence and terror. More importantly, according to Fatah, Addameer is an affiliate of the PFLP. Addameer’s former vice-chairperson Khalida Jarrar is a senior PFLP official. Jarrar was administratively detained on April 1, 2015 by Israeli security forces. On April 15, 2015 she was indicted for various offenses including active membership in a terrorist organization (the PFLP) and inciting violence through a call to kidnap Israeli soldiers to be used as “bargaining chips for the release of Palestinian prisoners.” Jarrar accepted a plea bargain and was reportedly convicted on “one count of belonging to an illegal organization and another of incitement” receiving a 15-month prison sentence with an additional 10-month suspended sentence. She was released from prison on June 3, 2016. According to Addameer, Jarrar was re-arrested in July 2017 for six months. In December 2017, the detention was extended by another six months to July 2018. At least 10 other Addameer staff members have ties and/or have been arrested for being affiliated with the terror group. On May 3, the CCR delegation held a video session with founder and director of the Palestinian NGO Palestinian Centre for Human Rights (PCHR) Raji Sourani. On, May 3, Justice Delegation participant Natasha Lycia Bannan tweeted that the group met with “An Afro-Palestinian legend.” This refers to Ali Jiddah, a member of the PFLP who was imprisoned by Israel for 17 years for carrying out grenade attacks against Israeli civilians in Jerusalem in 1968. 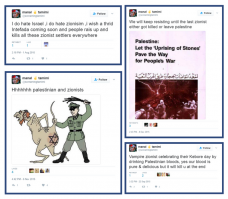 BADIL is a Palestinian NGO that holds annual “right of return” contests and has published virulently antisemitic cartoons as well as imagery promoting the elimination of Israel. On May 2, the CCR delegation went on a tour of Jerusalem and the West Bank. On May 1, the CCR delegation went on a tour of Hebron with the Israeli NGO Breaking the Silence. Breaking the Silence makes sweeping accusations based on anecdotal, anonymous, and unverifiable accounts of often low-ranked soldiers. These “testimonies” lack context, are politically biased, and erase the complicated reality in the West Bank. In addition, they reflect a distorted interpretation of the conflict in order to advance the political agenda of Breaking the Silence activists, thereby fueling the international campaigns against Israel.